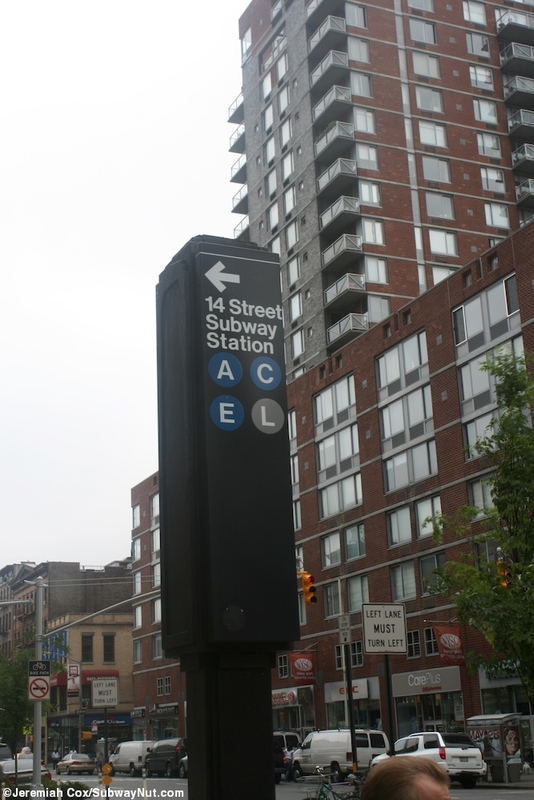 14 Street on the IND 8 Avenue subway line is an express stop with two island platforms for the four track line. 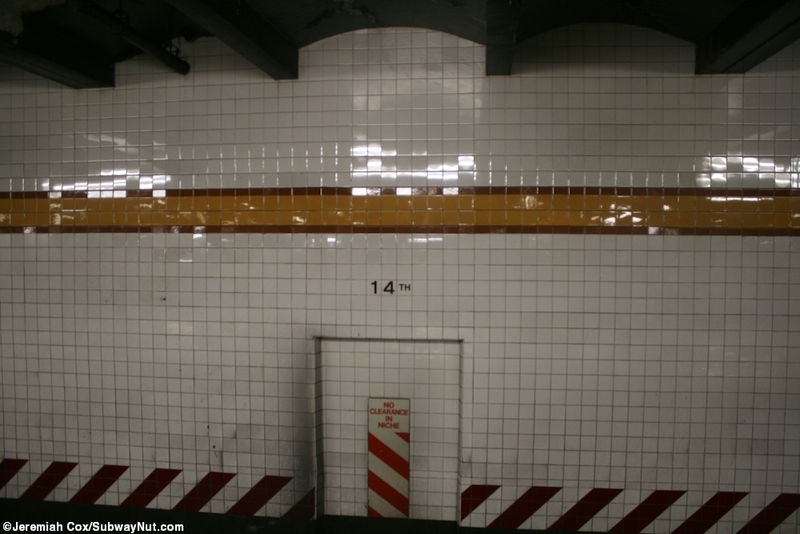 The track walls have a replica yellow-orange trimlines from a 1999 renovation with a narrow maroon boarder, and 14th written in black write on tiles beneath. 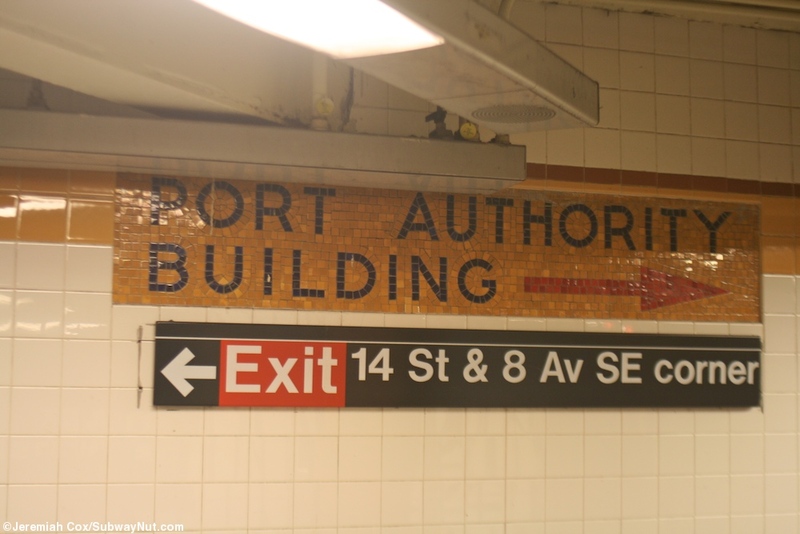 There are even 14 St name tablets along the mezzanines. 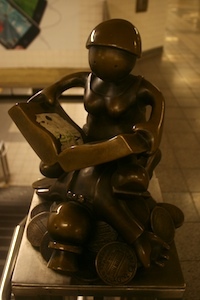 The bronze models throughout the station installed under Arts For Transit are one of the highlights of the station. 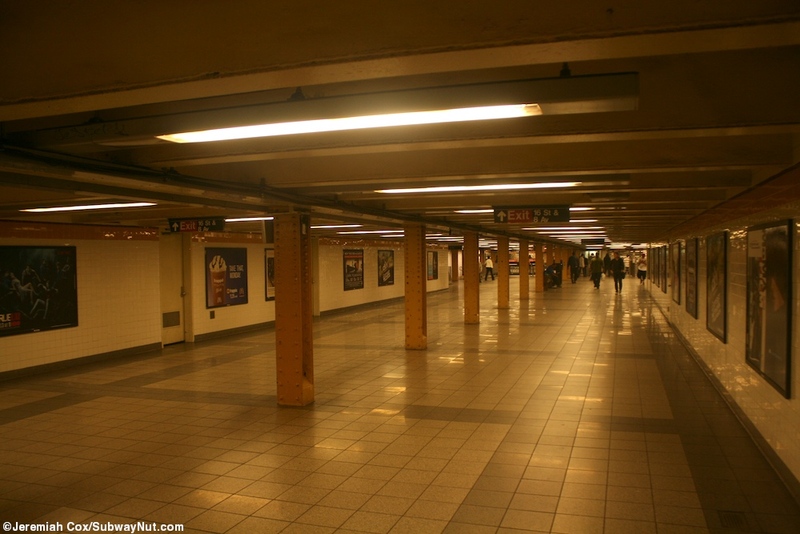 There is a single line of yellow-orange columns that run down each platform. 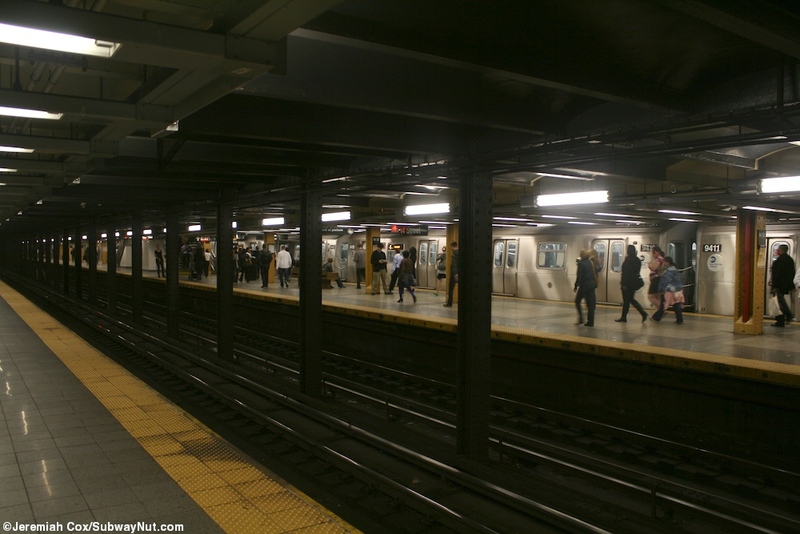 The station has almost a full-length mezzanine (ends shortly before the northern end of the platforms) with plenty of staircases down it. 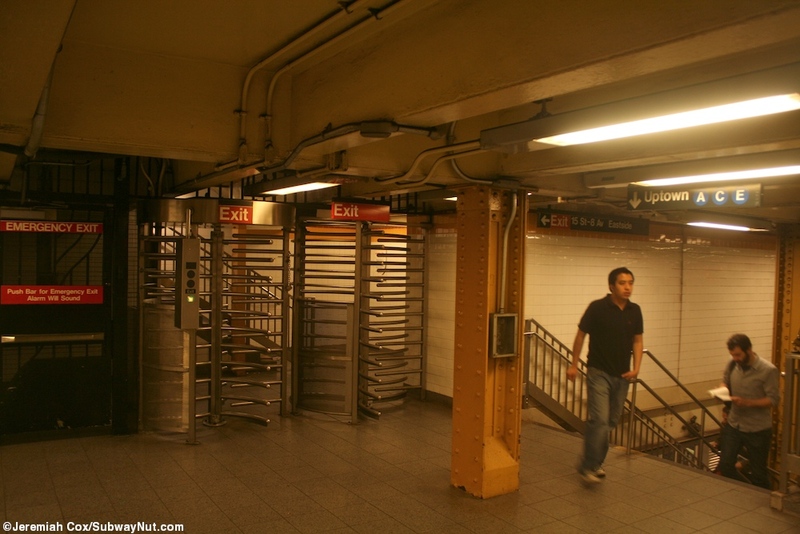 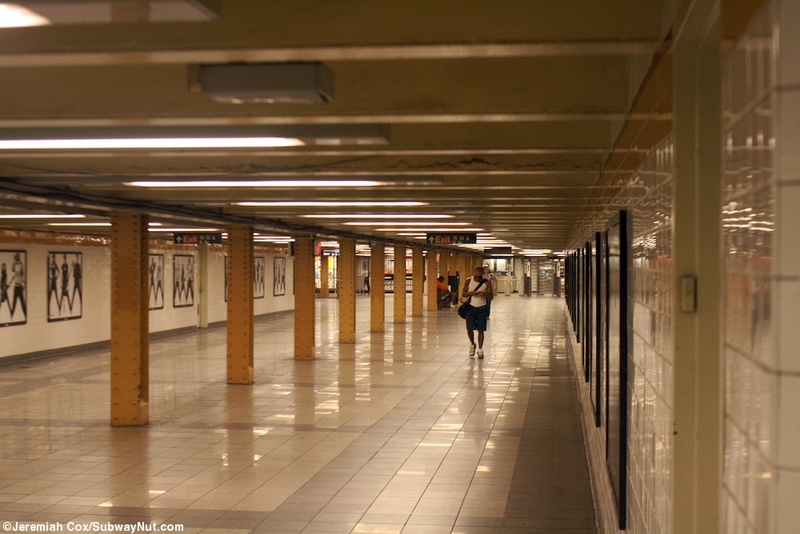 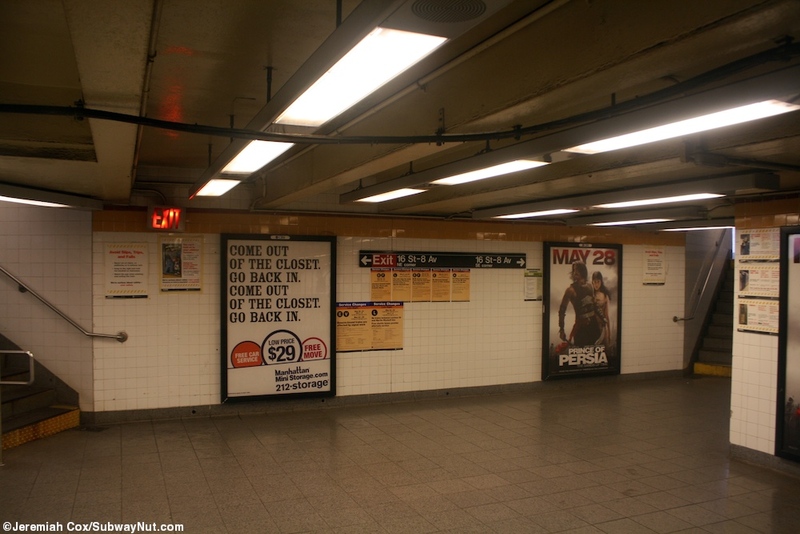 Exits from the mezzanine start with an unstaffed bank of turnstiles at its northern end for 16 Street and 8 Avenue. 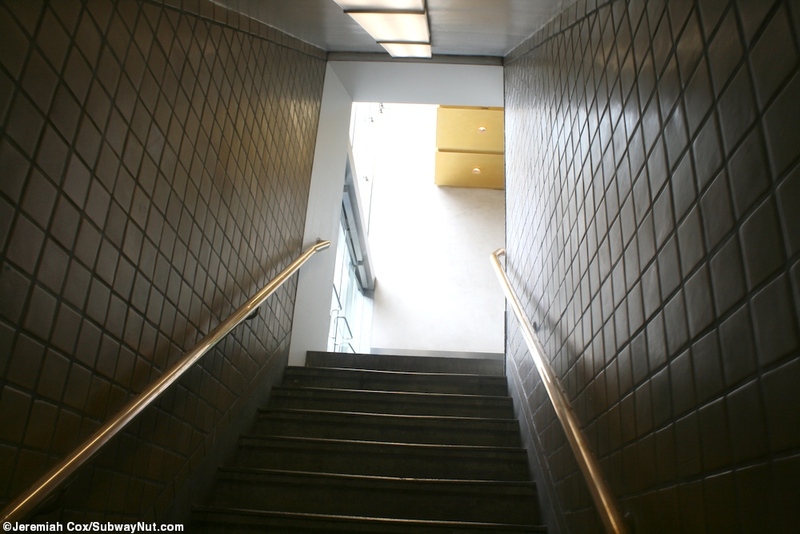 Here there is a passageway and staircase up to the Port Authority Building (that also has its mosaics throughout the station) arriving right near the SW corner between the outer doors out to the street and inner doors into the building. 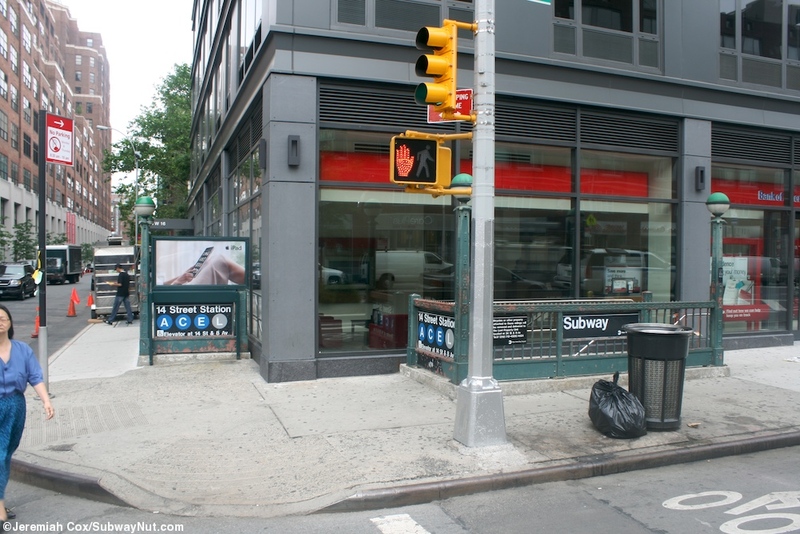 The only way of knowing there is a subway station here is by a small unusual post on the sidewalk pointing towards the doors into the building. 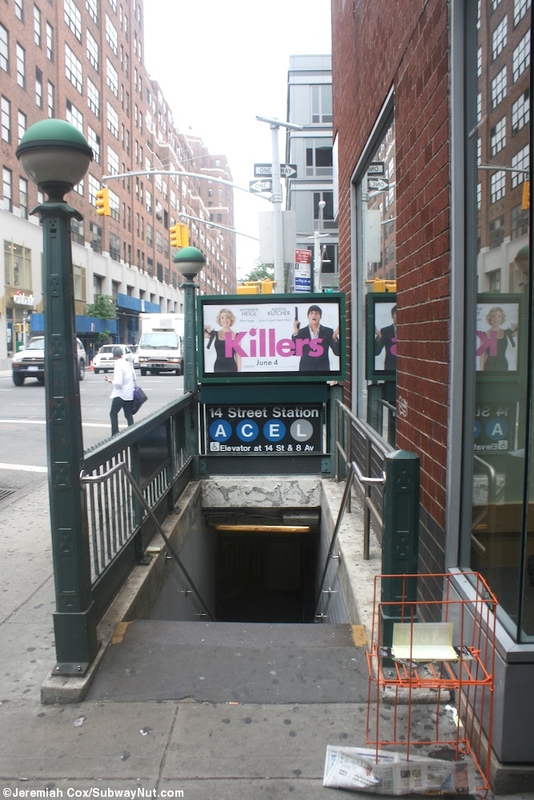 The other corners include two streetstairs at the NW and one each at the NE and SE. 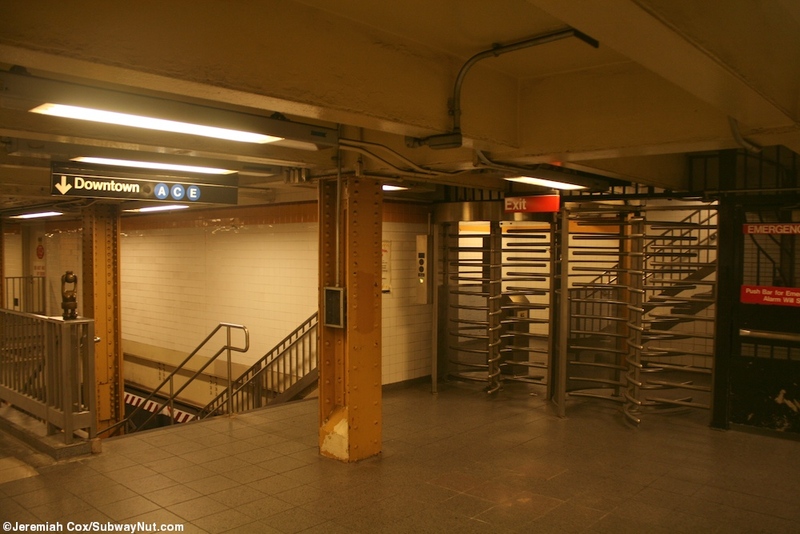 Along each side of in the middle of the mezzanine there are a few high turnstiles to their own street stairs at the NW and NE corners of 8 Avenue and 15 Street. 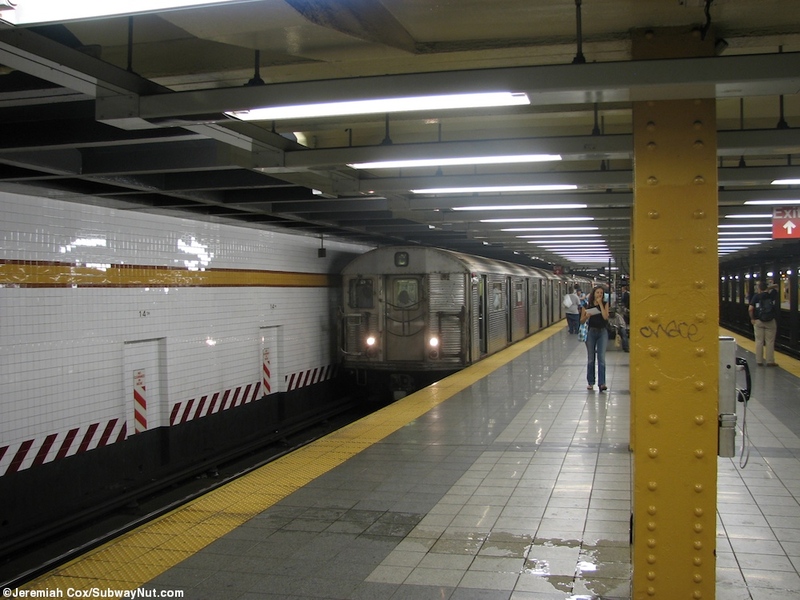 At the southern end of the station is where things get more complicated with the transfer to the L train beyond the staircases to the extreme southern ends of the IND platforms. 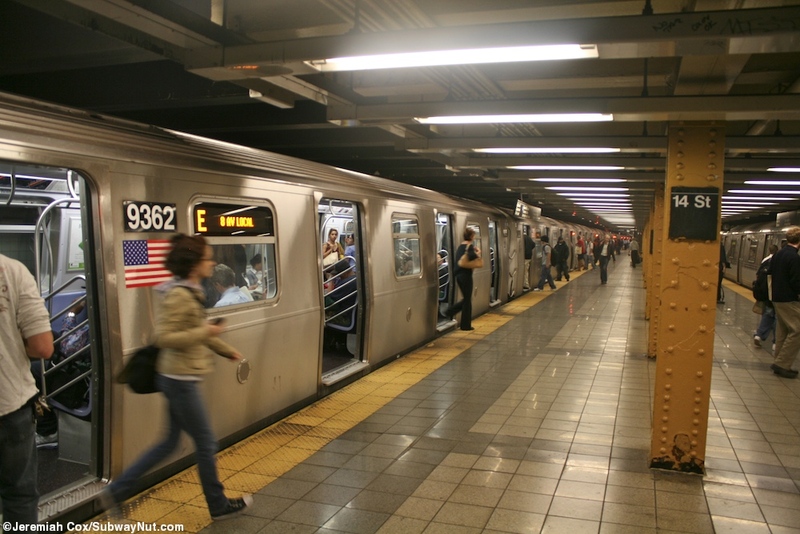 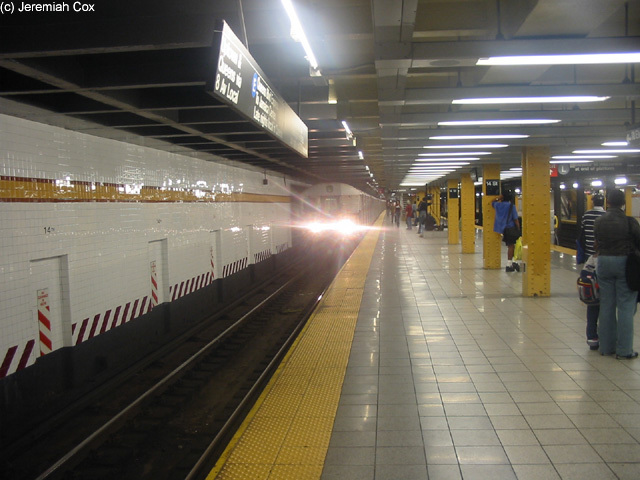 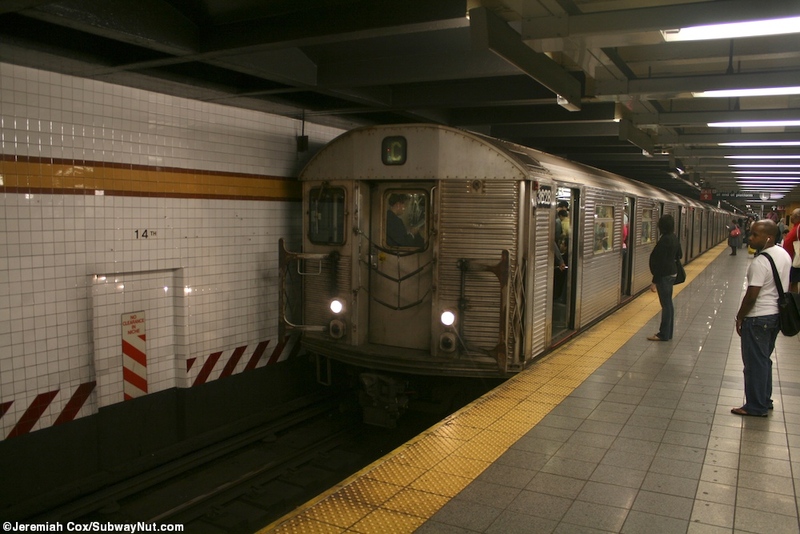 Conductors sometimes even announce 'Transfer to the L train at the front or back of the train.' 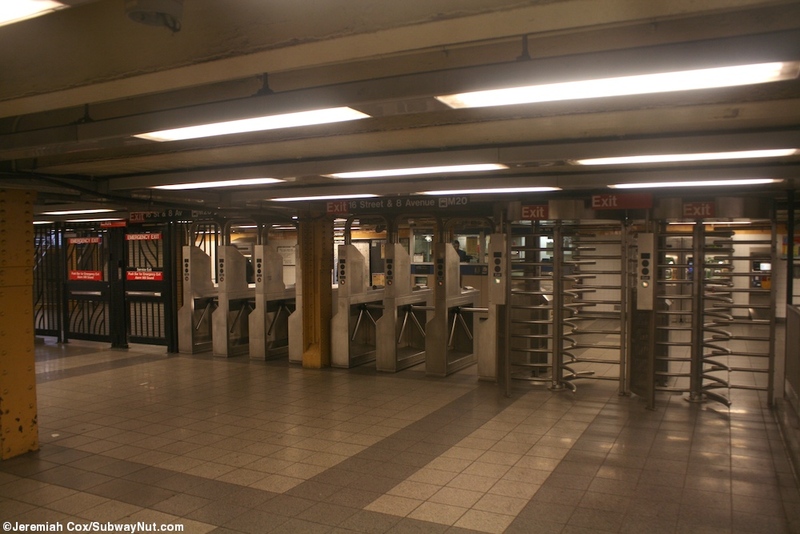 There leads to a small bank of high turnstiles on one side of the transfer passageway out to a street stair at the NW corner of 14 Street and 8 Avenue, on one side of the passageway to the L train, on the other side the main large banks of turnstiles to the large fare control area with the full time token booth. 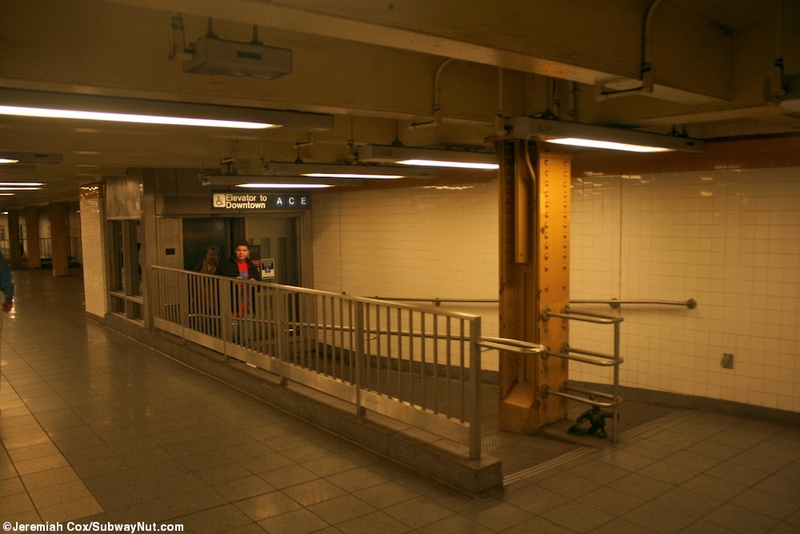 This fare control area has a streetstair and platform elevator to the NW corner, and single streetstairs to the NW and NE corners. 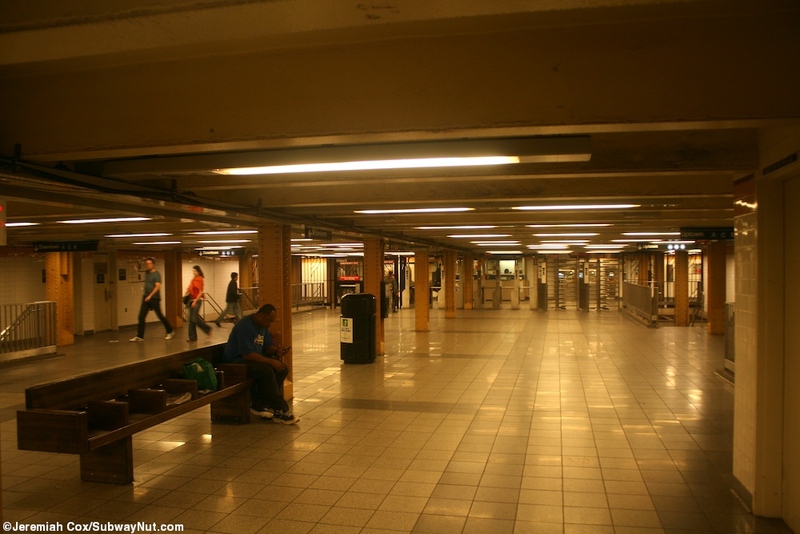 This entry area is home to NCYT signal school and other training areas for employees. 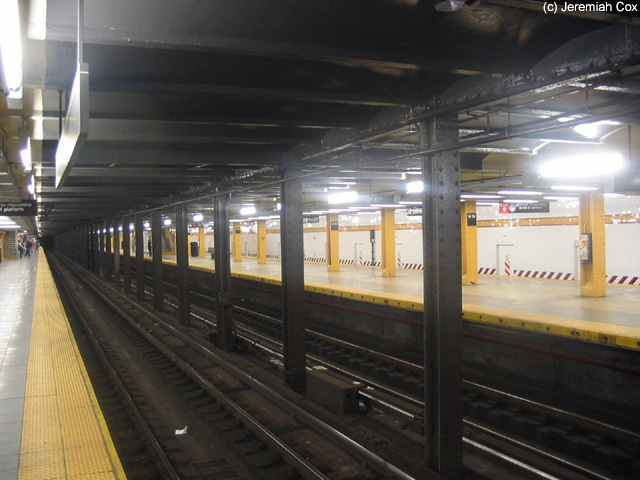 Sings are visible from the public areas.